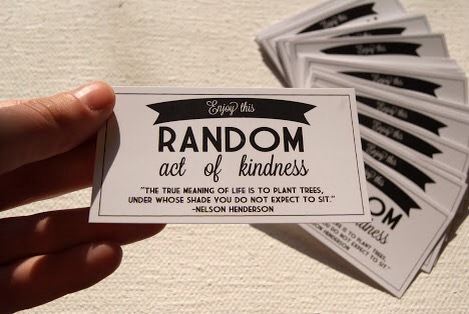 Today’s insight journey led me to the idea that we should never underestimate the beneficial power of random acts of kindness. My guess is that most of us are accustomed, in some way or another, to doing nice things for people when we are asked to do so, whether it is acquiescing when someone asks us to wash their car, review their power point presentation in an effort to ensure that there are no errors, or even join them for lunch because they do not want to eat alone. And performing acts of kindness under those circumstances is great, in fact it’s what we are supposed to do as human beings. However, what about times when ideas to do nice things for others who have not asked us to do anything for them come to us? What do we do in those moments? Do we quickly usher those ideas out of our minds, or do we contemplate those ideas and figure out ways to bring them to fruition. My hope is that we choose the latter more often than the former, as performing random acts of kindness for others blesses them and us at the same time. It blesses the recipients in that they are the ones who are receiving something nice. It blesses us in that it reminds us of how we, too, need assistance at times, which in turn helps us to remain humble. And it actually blesses other people who are not even directly involved by demonstrating to them the fact that love is still alive in this world, as well as providing for them an example of the power that sharing love with others possess.